Conveniently located less than 2 miles from Disney Springs™ and the rest of Walt Disney World®, Clarion Inn Lake Buena Vista is where you want to stay in Orlando, Florida. It’s surrounded by theme parks, entertainment venues, restaurants, shopping areas, and other attractions that the entire family can enjoy. The hotel’s proximity to SeaWorld® (less than four miles) and Aquatica® is also ideal for guests wishing to spend a day or two away from the Disney® area. Equally close are other entertainment options on International Drive. 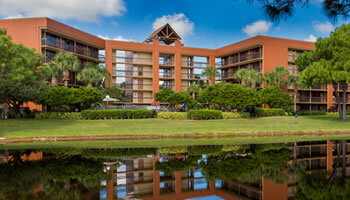 Clarion Inn Lake Buena Vista is a AAA 3 Diamond hotel with 640 guestrooms. The hotel underwent a multi-million dollar renovation that included a number of upgrades to the guestrooms and amenities. For pictures of the upgrades we encourage you to browse through our photo gallery. The hotel is beautifully landscaped with plants and flowers native to Florida. We are situated in the Palm Parkway resort area on 23 acres of lushly landscaped gardens and water features surrounded by a private, secured entrance. All guestrooms have a compact refrigerator, microwave, coffee/tea maker, an electronic safe, and a 32” flat panel HDTV with premium channels to make you feel at home. We provide free Wi-Fi for guests, so don’t hesitate to bring your laptop. As part of the renovation each guestroom received new Simmons Beautyrest® pillow top mattresses, alarm clock radios with MP3-playing capability, remodeled bath vanities and fixtures, furniture, and new electronic door entries with state-of-the-art RFID technology. Our linens feature triple sheet bedding and a fresh new look for our beautiful buildings. Your comfort is our top priority. To best accommodate every guest, special requests will be granted based upon availability at the time of check in on a first come, first served basis. Special requests include but are not limited to upgrading bed types to a king or requesting a room in a specific building or on a specific floor. For more information about accommodations and events give us a call at 800-999-7300. Our main priority is the safety and well-being of our guests and associates. Rosen Hotels & Resorts reserves the right to visually inspect all guestrooms for wellness checks, security, maintenance, or other purposes, even when the Room Occupied sign is displayed.